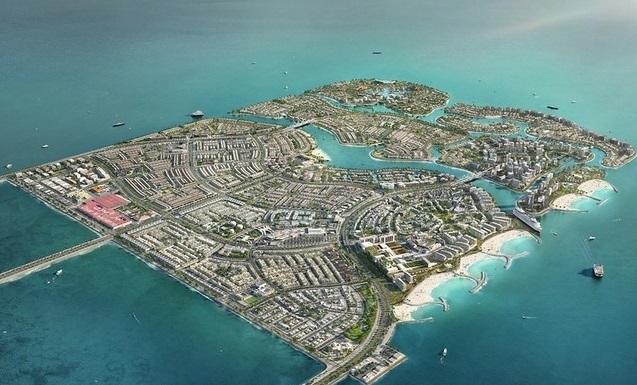 Bahrain’s Diyar Al Muharraq, a US$2.5 billion waterfront city development at Bahrain Bay comprising seven islands, reflects sustained investor appetite for the region’s property sector, its chief executive says. Maher Al Shaer, the chief executive of Diyar Al Muharraq, will present the development at the Cityscape Global in Dubai, which runs from Spetmeber 6 to 8. “Real estate still remains a safe investment option, especially in this region,” he says. Bahrain is proving resilient in the face of the global slowdown, according to recent reports from Reidin, a property business analysis firm, which says the construction industry posted 4.5 per cent year-on-year growth rate last year. Some 11.6 million tourists visited the island, an increase of 11 per cent on the previous year. “If we look at Bahrain, there has been a surge in real estate projects as well as construction and retail industries with new malls, luxury hospitality offerings and the recovery of mixed-use developments previously put on hold,” says Mr Al Shaer. According to Reidin, Bahrain’s tourism sector is expected to continue to expand, generating revenue of $1bn by 2020. This trend, combined with the government decision to allowing foreigners to acquire 100 per cent ownership of businesses in Bahrain, will spur growth in the property sector, it said. Gagan Suri, the director and chief executive of Bahrain Bay Development, says it is the size of such mega-projects that is a part of their resilience, despite global volatility. “Large real estate master developments are planned with longer-term durations and longer investment horizons,” he says. “As such, Bahrain Bay Development, as a master developer, is able to overlook short-term blips in the market including fluctuations in oil prices. Master planned developments are unlike consumer goods, which are quick to produce and quick to get absorbed. Real estate products take time to plan, develop and get absorbed. Bahrain, like most GCC countries, is also exposed to a cyclical market. Almost 85 per cent of land plots at Bahrain Bay were snapped up within a week of going on sale, while the entire infrastructure is complete and several projects of third-party developers are also finished, the company says.